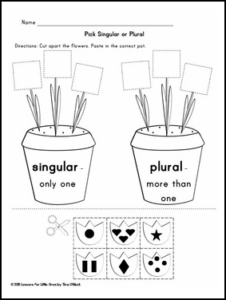 Practice the meaning of singular and plural with this free sample that includes a flower-themed center activity and 2 practice pages. Printable answer keys for the centers and pages are also included. Center Activity: Students demonstrate their understanding of singular and plural by “planting” flowers in the correct flower pot. If the picture on the flower shows one item, they plant the flower in the singular pot. If the picture on the flower shows more than one item, they plant the flower in the plural pot. Includes 2 practice pages for singular or plural. – printable answer keys for the centers and all pages. TpT gives credits for every $ you spend ONLY after you provide feedback. You may use your credit points for future purchase of any TPT products! If you decide to purchase, please don’t forget to leave feedback, a fair rating and a fair comment Click HERE for more information about TPT credits.